SAINT JOHN – Eight rods, three days, exclusive world-class living at the mouth of Rocky Brook on the Southwest Miramichi, and as much salmon as you can haul in. And all it will cost you is $26,500. 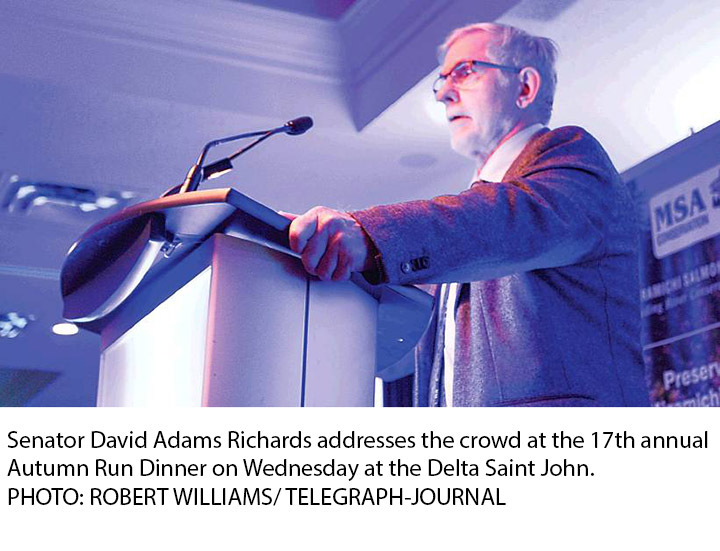 The Atlantic Salmon Federation, in partnership with the New Brunswick Salmon Council and the Miramichi Salmon Association, hosted its 17th annual Autumn Run Dinner on Wednesday, bringing together some of the biggest names in the province under one roof for a night of silent and live auctions. Historically, a dinner like this will gross anywhere between $125,000 and $175,000 -- it all depends on the appetite of the crowd, said Robert Otto, chief operating officer with the ASA. The crowd was nibbling on Wednesday. The official count won’t come in until later in the week, but more than one of the live auction items -- ranging from a dessert of your choice every month for a year to a four-rod, two-day trip -- went for thousands of dollars. On the menu, chicken with mashed potatoes, carrots and broccoli. For an appetizer, smoked salmon from a salt water, land-based, closed containment facility in Nova Scotia. He spoke briefly, winding stories of fishing, the Miramichi and his childhood friends in a tight five-minute set. “I don’t know what fishing does for anyone else but for me, it was almost spiritual,” he said in an interview after his speech. He chose not to mention his recent inquiry into the “decimation” of the province’s Atlantic spawning grounds. And no mention of a possible Senate committee looking into the matter. But he didn’t shy away when asked. “I am a writer of the river,” he said. Bill Taylor, president of the ASF, spoke frankly about the Department of Fisheries and Oceans needing to do something about the rising striped bass population, and lowering salmon populations in the Miramichi River. He said the goal is finding a balance for the two species. If you care about the Atlantic Salmon WE NEED YOUR HELP!